Sourcing of components for future French operations. The quantum of offsets includes investments in terms of Transfer of Technology for manufacture and maintenance of eligible products and services. The technology transfer will help scale up the production of the indigenous Tejas aircraft. The Kaveri jet engine project may get restarted with the help of Safran. Out of the total commitment of Rs 30,000 crore. The agreement stipulates that 74 percent of the offset value must be discharged through component exports from India. There is also a six percent technology sharing component of the total offsets, which is being discussed with the Defence Research and Development Organisation (DRDO). In order to fulfil the mandatory offsets under the deal, the obligators have to invest 30 per cent of the total order cost in India's military aeronautics related research programmes and 20 per cent into local production of Rafale components. 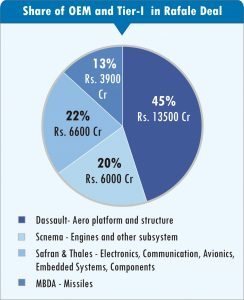 Dassault and its Tier-I besides, Reliance Defence, arenegotiating with number of Indian firms which are likely to be offset partners. The main OEM with Fuselage, Ailes and Final Assembly accounts for about 55-60% share of Offset obligation, has entered into a Strategic Partnership with India's Reliance Group in Oct 2016 and announced to establish a joint venture (JV 51:49 in favour of Reliance) named as 'Dassault Reliance Aerospace' in India. The JV to be focused on supporting the IAF's Rafael programme through the production of aero structures, electronics, and components for the aircraft's Snecma M88 engines. The JV will also "develop major Indian programmes with high levels of technology transfer”. The JV is based at an aerospace industry park that the group is developing in Nagpur, where RDL has been allotted 289 Acres of Land by Maharastra Govt. The facility in Nagpur will produce subsystems and components and export them to Dassault Aviation for the production of Rafale fighter Jets in France. The components manufactured at Dassault Reliance Aerospace JV facility in India will form the part of Global Supply Chain for Dassault Aviation and other partner companies in other countries. The company has tie-ups with BDL and Hindustan Aeronautics Limited (HAL) and also DRDO. Snecmais Tier-I vendor with share about 25% and responsible for the M88 engines that power this twin-engine fighter, available in both air force and naval versions. The M88 features state-of-the-art technologies, including compressor "blisks" (integrally-bladed disks), single-crystal high-pressure turbine blades, powder metallurgy disks, ceramic coatings, composite parts from Aircelle and nozzles made using thermo structural composites from Herakles. It has an equally-owned joint venture with HAL in Bangalore. There is also a tie-up with Max Aerospace. Safran would be providing electronics, communication, avionics, components systems and their likely share is going to be 10-15%. SAFRAN has an arrangement with HAL for building RLG-INS like Sigma-95N & Sigma-30. In addition, SAFRAN is negotiating various joint R & D with DRDO. Safran has tie-ups with Max Aerospace, BEL and also has a subsidiary Safran India Private Limited which are likely to be getting orders for discharging of offsets. Thales Avionique: System for Reconnaissance full imagery intelligence (IMINT) system composed of an airborne pod and a ground station. Front Sector Optronics FSO: Operating in the optronic wavelengths, it is immune to radar jamming and it provides covert long-range detection and identification, high resolution angular tracking and laser range-finding for air, sea and ground targets. SPECTRA internal Electronic Warfare suite: Jointly developed by Thales and MBDA, is the cornerstone of the Rafale's outstanding survivability against the latest airborne and ground threats. Apart from having wholly owned subsidiary, Thales India Pvt. Ltd., also has tie-ups with HAL, BEL, Samtel and L&T Technology Services. A joint venture (JV) Thales Reliance Defence Systems (TRDS) will have a shareholding of 51 per cent with Reliance and 49 per cent with Thales. The JV is a part of Thales' offset plan for the Rafale fighter jet deal, demonstrates “long-term commitment to the high technology aerospace industry in India. Thales' share in the total offset is about $1 billion and new joint venture company TRDS will be executing this offset at the mammoth Dassault-Reliance Aerospace manufacturing facility in Mihan, Nagpur. The components manufactured by JV facilities in India will form the part of Global Supply Chain for Dassault Aviation and other partner companies in other countries. Joint ventures are independent agreement between two private entities and that the government does not have any role in this. Joint venture will be beneficial for the country because it will generate jobs and impart valuable skills to Indian engineers in the field of defence manufacturing. The partnership opportunities created by Offset provision will develop major Indian programmes with high levels of technology transfer. The components manufactured by JV facilities in India will form the part of Global Supply Chain for Dassault Aviation and other partner companies in other countries. The analysis of relevant paras relating to Offset Partner provisions in the Defence Procurement Procedure-2016 (DPP- 2016), the OEM/vendor/Tier-I sub-vendor are free to select the eligible Indian Offset Partner (IOP) for implementing the offset obligation. It is a business decision and the obligator will execute the offset obligations which have penalty provision for not meeting the timely obligations. An OEM or its Tier-1 are to provide their details at the time of seeking offset credits, or one year prior to discharge of offset obligation. The bogey that RIL had no experience in manufacturing, as it neither had any industry experience nor any required assets. Let us face the fact who in India has such experience in theirs sector ? HAL whose sole role is manufacturing defence planes have failed in timely supply to the OEM on offset obligations and they are facing penalty. The DPSU has not been able the deliver even it yearly workload despite all the experience and infrastructure. As a result of the smear campaign. HAL prime business is absorbing technology, manufacturing and integration, not offsets, although some part of the offsets could come to HAL. A majority of the offsets shall go to the Defence Research and Development Organisation (DRDO) and other private sector. HAL own capabilities have come under the glare of public attention. A study of HAL inability to deliver on several fronts, time and cost overruns, defects and quality issues resulted in grounding and un- serviceability of platforms for a long period, affecting the operational preparedness. The capabilities has little to show in terms of delivery and accountability, altogether endangering, the airpower dimension of national security. Even 71 years after Independence, India does not have an industrial base for designing and almost all aero platforms and major sub systems are being licenced-produced. The envisaged indigenisation level of 50% is yet to be achieved. Thus one should not be surprised as to why Dassault refused to take responsibility for planes made by HAL and select as Offset partner, as the company “could not risk its global reputation” by partnering with the HAL. Private sector has been struggling to participate in defence sector for last over a decade and have shown some remarkable contribution. Reliance Group entities involved in defence are Reliance Infrastructure Ltd, Reliance Defence Ltd, Reliance Naval and Engineering Ltd (RNEL), and DRAL. Together, they have 35 industrial licenses for manufacturing various defence products. Beside unless a chance is given to Private sector we should not pass the judgement. Issues raised in the press like Reliance Aerostructure Ltd (RAL) incorporation, license to manufacture fighter aircraft in 2016 and it did not own any land or building before granting IL are of no consequence as these are as per provisions of IL/ Offset guidelines. As per offset provisions an OEM and its Tier-1 vendors are free to choose its offset partners and Govt. has no say the selection of partner. RDL plan to be part of Dassault's global supply chain by manufacturing parts for a civilian aircraft. In the process, it is expected to build its aerospace manufacturing that might be leveraged towards future projects. One thing is certain that the accusations are not collaborated by facts or it is deliberate attempt to ignore the reality. The country like ours needs to realize that there were no limitations in developing new capabilities across the entire spectrum of aerospace. Indian industry can leverage indigenous developments and manufacturing techniques for future worldwide upgrades of the platform and leverage the manufacturing capability for development of future indigenous capabilities. Long-term partnerships with OEM will assist in creating an eco-system supporting indigenous capabilities into the private sector in the domain to be part of global supply chain. A word of caution, there may be benefits in terms of technology acquisition, employment in local manufacturing but not necessarily cost effective due to various reasons such as cost of Plant and Machinery, Production efficiency, culture and Training cost etc. For example due to higher labour input, an Indian-made Su-30MKI costs more than one purchased directly from Russia. Such partnership will bring new manufacturing skill sets - processes, technology, workforce skill development, tools, quality requirements, materials manufacturing, integration and test techniques. It is not just about structural and component manufacturing but brings skills in hydraulics, avionics, electronics, engine components, radar components, ground systems etc for manufacture in India. The partnerships would involve not just the aspiring strategic partners, but an extensive selection of MSMEs, a significant number of whom would become key suppliers of systems, subsystems, parts, components, repair and MRO for India as well as the largest global supply chain for fighters with over 3500 platforms in service until at least the mid 2040s and potential to join later generation supply chains in the future.